Seeking Wisdom from a Jedi Master outside the Cinnabon | Write Your Own Story! The recent headlines surrounding Disney, J.J. Abrams, and the Star Wars franchise reminded me of my own brush with the Force. 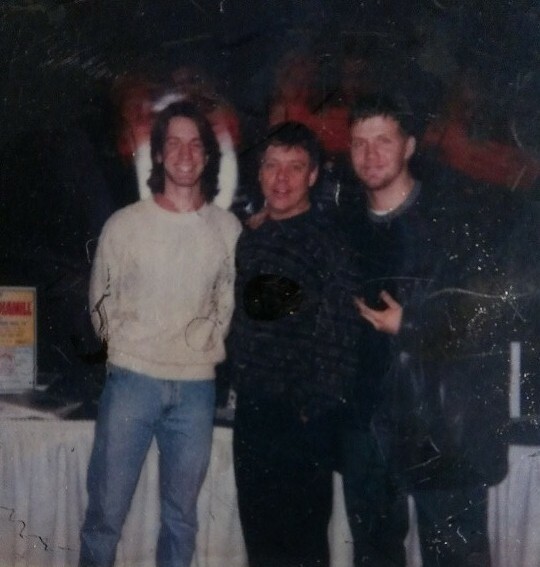 A long time ago, at a shopping mall far, far away, my friend James and I waited in line to meet the actor Mark Hammill. He was promoting some obscure indie film he had made, and was cashing in on the buzz around the Star Wars prequels to make an appearance at the local cineplex. We anticipated it would be something of a Spiritual Journey for us, to be in the presence of a Jedi Knight. So we boarded my 1979 Chevy Impala, which famously made a Taco Bell run in under 12 parsecs, and took our first steps into a larger world. The line extended before us into Infinity, and we were surrounded by all manner of reclusive, obsessive, mutant fanboy, the kind that can recite from memory the number of the trash compactor from Episode IV (it’s 3263827), but can’t muster enough Force to talk to a girl that isn’t their Mom. Mayfair Mall… you will never find a more wretched hive of scum and villainy. Finally, as we approached the Mountaintop, at the feet of the Master, Luke Skywalker himself, I struggled to find something to say, or ask. I had just completed the graveyard shift at the old Try n’ Save grocery store, so my brain was fried. And you know how these things work. You shake a hand, exchange a pleasantry, maybe take a photo, and you are done. Mall security discourages too much interaction. These aren’t the droids you’re looking for. Move along. Our Hero: “Wow, hey man… thanks for, you know…. um, with the… I mean, Corvette Summer? That is, I just… Mmmmmay the force be with you?”. And that was it. No Spiritual Experience. No Sacred Wisdom imparted. No Jedi training. Thank Yoda for James, though. He is not the type to waste an opportunity of this much moment. This guy usually gets his money’s worth. In only a brief moment, James passed along his greetings and asked a fairly complex question about an even more obscure film that Hammill had done in 1993 called Time Runner. It seems that James had enjoyed the film overall, but was left thoroughly flummoxed by the ending. As previously mentioned in other posts, I have made a commitment, a Solemn Oath, to stop making excuses and relentlessly pursue a career in screenwriting this year. My wife and family have made sacrifices. I cut my hours at the Parking Meter Factory to spend more time on my Heroic Quest. We have been struggling. And for all my effort this month, I have been struggling to make enough progress toward my goal. One of my short term goals is to enter the Industry Insider Sceenwriting Contest, which closes next month. I chose this contest because it breaks down the writing process into manageable chunks, perfect for somebody who struggles with ADHD. You start with a logline, then you enter the first fifteen pages of a script. If you have done enough to distinguish yourself, then you work with a professional mentor to help you develop the screenplay over the next few months. The winner earns meetings with production company stakeholders, and possible future cinematic glory. Much of my problem revolves around perfectionism. I never seem satisfied with a scene, a line, a word. And it paralyzes me. I’m off to a flying stop. “In my opinion, there is a lot of room for stories that are less than perfect. I’ve never seen Time Runner, but I’m guessing the writer of the film may have been overthinking it. As my Wife likes to say, “Perfect is the enemy of the good”. So today, the wisdom comes not from a Jedi Master, but from a woodcarver and an old friend. James has always been wise beyond his years, so no surprise there. I wouldn’t have expected it from the woodcarver, though. Geppetto never struck me as especially clever.It just goes to show that what you may be looking for is often found where you wouldn’t think to look. Which is why next time I lose my phone, I am checking the refrigerator first. Because that’s where I found it this morning. Therefore, as I dive into my contest draft, I am going to shut off my inner critic and just carve the wood. They say that the Beatles wrote something like 100 songs before they ever wrote a hit single. And to hear Paul McCartney tell it, they were all pretty terrible. But that story reinforces what I’m coming to realize; that getting better needs to be the goal. Perfection will have to wait. This entry was posted in For Inspiration and tagged ADHD, Disney, Industry Insider Screenwriting Contest, J.J. Abrams, JJ Abrams, Luke Skywalker, Mark Hamill, Paul McCartney, Screenwriting, Star Wars, Wisdom, writing. Bookmark the permalink. What? You found your phone in the fridge? Why I oughta…. I, too, meant Mark Hamill! He was so short. Too short to be a stormtrooper, indeed. Although less-than-perfect films come out all the time, the bar is still set pretty high for screenwriters, especially for those that have yet to prove themselves. I think there’s definitely some wisdom in knowing when to call it done, but settling for something that’s less than your absolute best effort is just as dangerous — if not moreso — than overwriting. Anyway, not trying to discourage you, just offering a word of caution. Keep it up and best of luck with your new script! I totally agree. My issue is usually in the draft phase, settling on the basics of the story. Once I have a set of building blocks and an outline I can live with (it’s rare), I have far less trouble executing it and polishing it. Love this post and your About page. I wrestle with perfectionism too, but remember, there is no story unless the Hero tries and fails a few times. You can fix anything about a first draft…EXCEPT the failure to actually write a first draft. I am working on it, perfection that is. One of the reasons I decided to do a blog was that I knew I would hate every post for all their imperfections, missed oppoortunities, and awkwardness. But I’m getting used to just having to gin up a draft quickly and publish on a self-imposed deadline. I am trying to take the same approach to screenwriting, just let it fly in the draft stage, but count on lots of rewrites. I know exactly what you mean. I used to have the same problem until one day my then 10 year old niece looked at me with great frustration after waiting weeks for me to finish a short story I was writing for her, and said “Auntie Carol,you always told me that if I try to make the cakes I bake perfect i’ll only spoil them. I think its the same with writing a story, if you keep changing it you’ll ruin it.” So now I have a picture of my niece taped to my laptop so I always remember to not “pick” at my work once its written. That’s a good idea. I edit my posts maybe five times after they are published.